This time of year is so busy, so full of making and doing, of performances and activities, yet still we somehow find ourselves with little bits and pieces of things that work their way into the schedule. 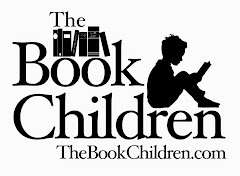 Things we do simply for the joy they bring. Over the weekend, I noticed we had a few mandarin oranges that were past their prime. I decided to slice them and dry them (in the oven at about 250° for a couple of hours, then left on the cookie sheet for another day to ensure complete dryness). 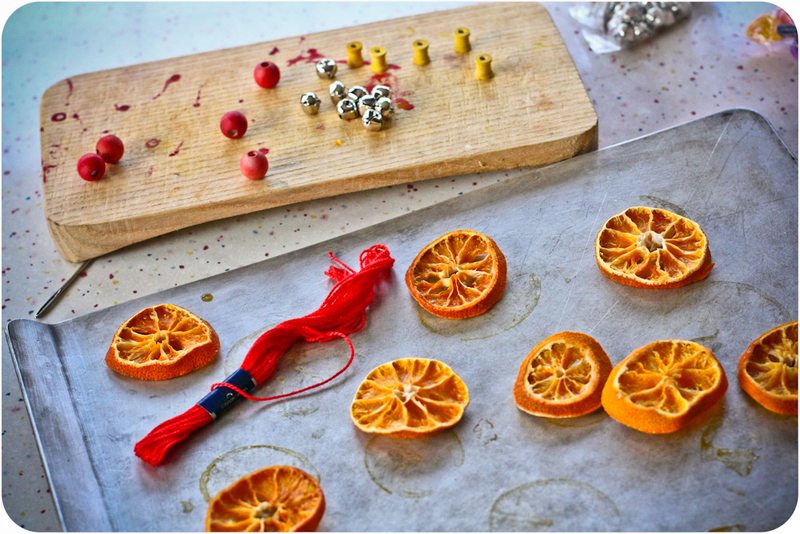 And we gathered some of our little crafting beads and bells and set to work making little orange ornaments. Finn painted all of the beads with watercolors and the total assembly time was about 15 minutes. 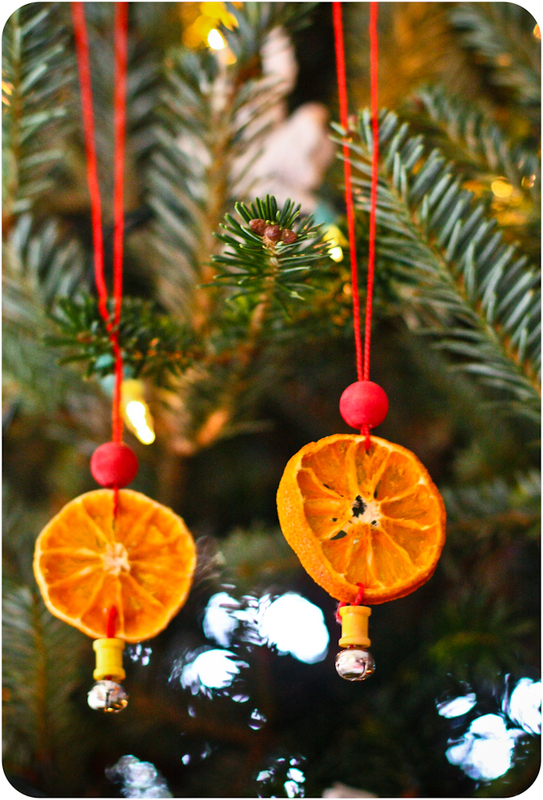 Just a few minutes really to bring a bit of merrymaking to our evening and mirth to our tree. And then a friend posted a link to these little cuties. Although my Christmas knitting list is still rather long, it seemed like a shame to miss out on this little bit of cuteness. So the Christmas knitting was put on hold, just for an evening, to add a few wee knitted trees to our mantle. And as you can see, I'm not the only one who is taking a moment to breathe during this busy season with a few moments of holiday crafting. Paulie made the little wooden peg guy with his straight and tall Santa hat. I'm glad the kids are learning to take a few minutes during this time of year to slow down, revel in the season, and find a bit of crafting that brings them joy. Those cable knit trees are truly adorable. I think I need one for my tree collection. I'm doing the same things right now, squeezing little projects in just for the fun of it. 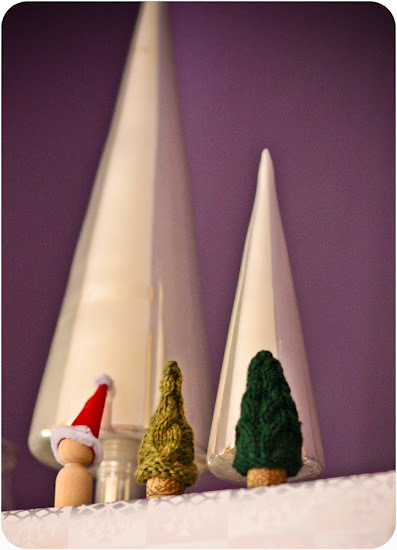 I LOVE those cork gnomes! Visiting again from KCCO! 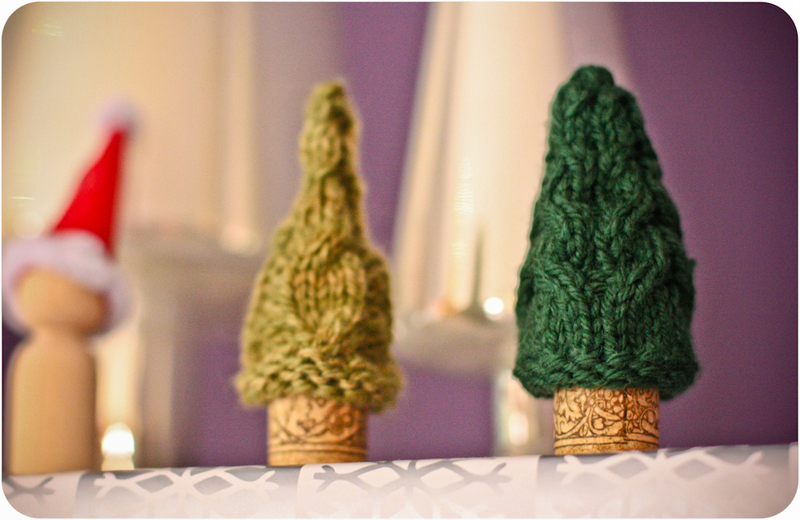 Those knit trees are about as cute as they come! You could sell those on etsy and I will be your first customer! Oh my goodness, those trees are adorable! Thanks for the link, I think I will make a few.